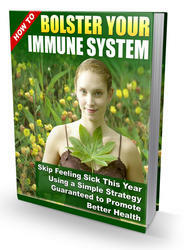 A virus enters the host through any opportunistic opening of the body. Minute breaks in the skin barrier or mucosal linings of the eye, nose, gastrointestinal, and urogenital tracts create portals for the virus to enter host cells and underlying tissues. 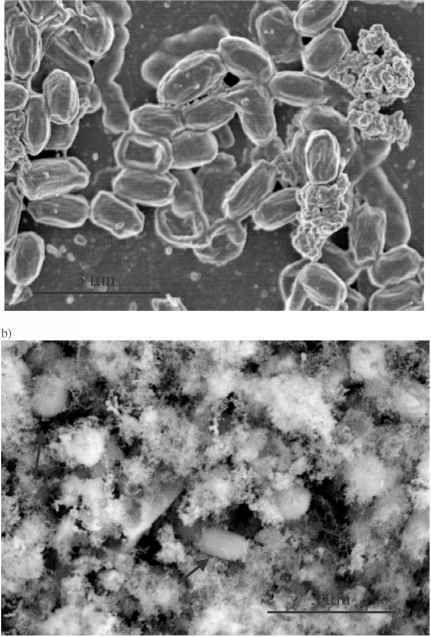 Replicating virus may establish a localized infection, or the virus, traveling as free virions or associated with immune cells, may spread to other areas of the body. Replication can continue at the initial site of infection or move to secondary organs and tissues. During an active infection, virus particles may be shed through nasal and respiratory secretions, urine, and stool. Time figure 4.2 (A) Adaptive immune response in an acute resolving infection. 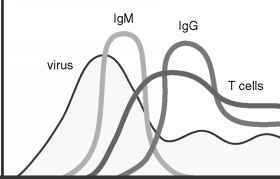 Low-affinity antibodies of the IgM isotype develop initially, and partially control circulating virus. 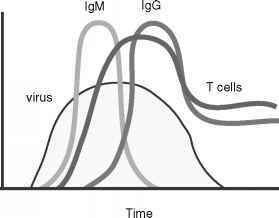 T cells undergo clonal expansion upon virus antigen stimulation. In response to effector T cells and often higher-affinity IgG antibodies, virus levels decline and the immune system differentiates into memory T cells. Such memory T cells and neutralizing antibody may persist for the life of the patient. (B) Adaptive immune response in a chronic virus infection. Antibodies and T cells develop but are unable to eliminate virus. Virus levels, although typically lower than in the acute stage, are continuously present despite a measurable immune response. Mechanisms leading to chronic infection include generation of viral mutants that escape the adaptive immune response, induction of immune exhaustion or tolerance, and a quiescent state called latency for some DNA and RNA viruses.